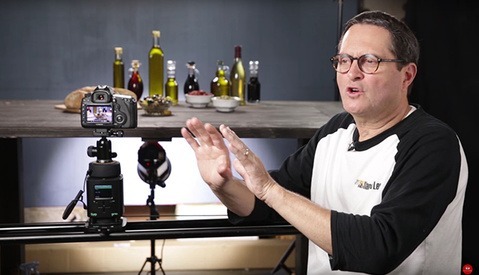 Jay P. Morgan of The Slanted Lens continues his video tutorial series of photographing simple three dimensional objects with this short tutorial on lighting a cylinder. The video demonstrates how to specifically alter the amount of light falling on the curved surface and flat face of the cylinder to achieve the desired effect. While the first two lessons of the series covered lighting a sphere and a cube, respectively, a cylinder is slightly more complex. Because a cylinder combines curved and flat faces, it is referred to as a “transitional object”, and demands special consideration when deciding how to independently control the amount of light falling on each face. Moving the key light on a vertical axis will control the length of the shadow cast by the cylinder. Raising the key light will also increase the amount of light falling on the top surface, and this effect can be countered by the addition of a diffusion screen. To control the darkness of the shadow on the core of the cylinder, a white fill card can be added. As with his previous two tutorials, a light directed on the white wall behind the cylinder is helpful in visually separating the cylinder from the background. Cylindrical objects are found all around us, and are popular subjects for product photography. 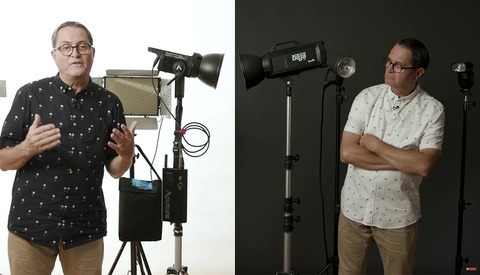 Morgan indicates that his next video will cover how to light multiple objects of different shapes at once, with the ultimate goal of the video series being to learn to translate the skills of lighting simple objects to real life situations. Had to do this for way too long in school. it's valuable for learning but it is the most soul crushing boring thing to photograph. hehe, our pain their gain!